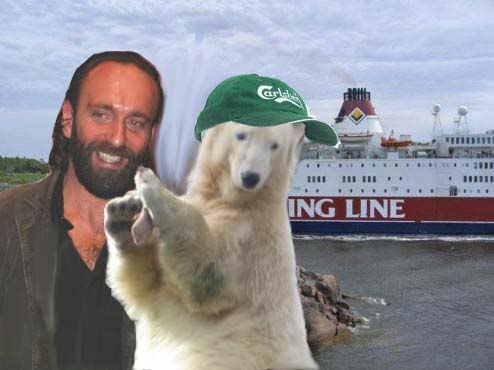 – Knut, Knut, Knut! Are you still sleeping, Wake up, it’s Daddy! – Have you done your packing yet? – Yes. Everything’s ready for the holiday. 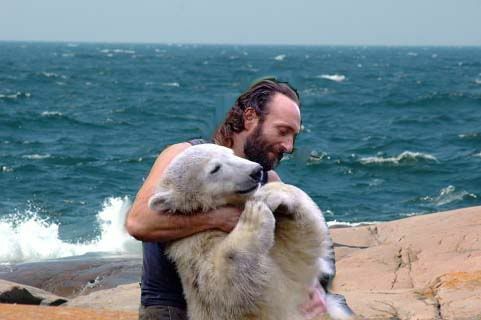 – KNUT! We are going for a holiday, we’re not moving! You don’t have to take all your toys with you. We’ll be back soon. – But Daddy, I love my toys. – OK. I only take my Teddybear and your Teddybear with us. – I’ll explain it to you later. – Papi! 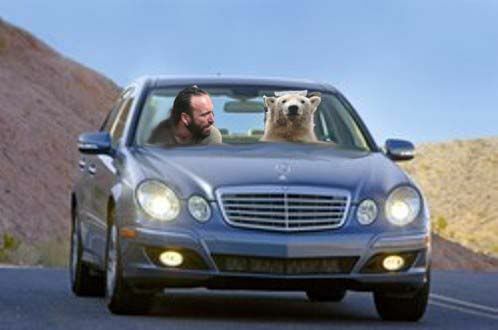 Why are you driving Knurzedes Bärz? A BMV (BärenMotorWerk) should be more knutish. 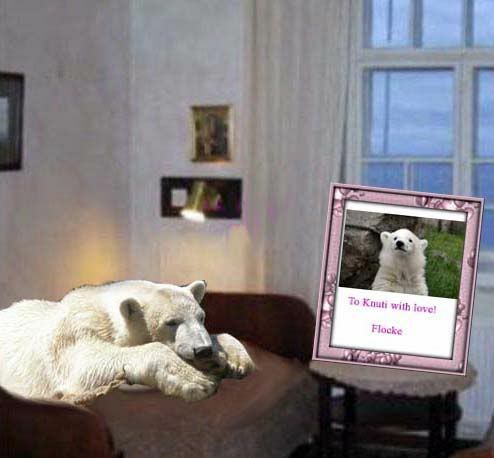 – Knut! Please, don’t complain! – I also got a Knuvigator as birthday present. I will now write ‘Aunt Mervi. Let’s drive to Sweden’. – Papi. I’d like to ask you a question. Does anybody cuddle yur? – Well, I was just wondering.. Herr Doktor Bl…Blä…Bla..Why must that man have a name noboby can pronounce? He came to me one day and said I mustn’t cuddle you anymore. He said I would injure you. Daddy, I swear, I would never harm you in any way. I love you! – Dear Knut, my sonny. Forget it. But why did you want to give me a teddybear? – Dear Daddy, I remember so well when we could hug each other. Since it’s forbidden now I hug my teddybear, close my eyes and imagine it’s you. I hope when you’re hugging your teddybear you’re imagining your huggin your Knuti! A little complicated but it works!! – I think I understand. – PAPI! Will you let me drive the car? – Because you have no driving licence. That’s why! – But I’ve seen you driving…PLEASE, PLEASE, DADDY! – OK. But first we have to get away from the Autobahn. – Daddy! Driving a car is such fun!!! – USE THE BRAKES! BRAKES, BRAKES. THERE’S THE POLIZEI! – Good evening! May I see your papers, please. – Daddy, why did the man faint? I just smiled and wanted to help. Shall I put my paw on his forehead? – Dear Knuti, it’s very kind of you but I think we’d better continue as fast as possible to Auntie Mervi..
– Oh, look there’s a big bridge! I want to have a bridge between my enclosure and Mami’s and Papa’s enclosure. Then I could visit my parents and my aunts as often as I want to..
– Please, Knuti, stop that hootering! – But hootering is so funny! – MERVIIII,Miffeeeee, Knuspaaaand!. Are you ready to join us??????????? – Oh, yes! Let’s go! – AND NOW TO FINLAND! – Auntie Mervi, are you afraid? Don’t be afraid – I can drive very well. – Stockholm! Look at that big ship!!!! – Knuti, I think it’s better I’ll drive the car to the ferry. Now you have to act like a teddybear. It’s safer – the passengers won’t be alarmed if they think you’re a big teddy. – Oh, you mean like Bruno? – Daddyyyy! I’m having such fun here in the children’s ‘ballsee’. They believe I’m Bruno….Now I’m HUNGRY! HUNGRY, HUNGRY!!! – Knuti, we’ll be eating here in our cabin. – “A special See Lunch”. That sounds yammy! Suits me fine! – Daddy, I like this Åland and Turku archipelago! There are a lot of small islands – we can go swimming and fishing…Fun! – Papii. Meeerviiiii, Mifffeee, Knusband!!!! Look – I can see Teddybärenmutti with her knusband and all the teddies! Wave, wave, wave!!!! – I wish you welcome to Turku. Did you have a good journey? And now I’ll drive first and lead you to our destination! – We are in a harbour again. That’s a very little ship. Where are we sailing? – Knuti, Knuti, take it easy!! – A tower with lights in the middle of the see. Why, Daddy? – It’s for the captains of the ships. With the help from the lighthouse they can navigate safely. – I want to visit the lighthouse!! – That’s our destination, little Knuti. – Papi, there are no trees – just stones. Can I go swimming?? – Of course, but don’t swim too far. We’ll be eating soon. – Knuti, it’s not a pool – it’s a sea. – Whatever – I love to swim here! – PAAAPIIII !!!!!! There are a lot of fish here. May I catch a few? – Catch as many as you like! The yellow press isn’t here writing about Knuti killing the poor fish…. – Hahhahhöhöhah. I certainly hope so..
– Daddy, you said that on a holiday we can do things differently from our usual ways. You’re always feeding me at the zoo so I’d like to feed you now. Attention – here comes a salmon flying…. – Tedybääärenmuuttiiiii !!!!! Would you like to have a salmon, too or shall I catch something else? – I’ll have anything you catch! 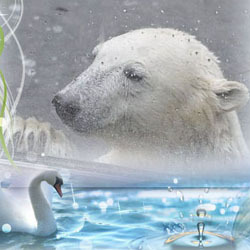 – Knut! It’s getting very late – time for us to go to bed! – Shall we take a nap? – No, it’s night and we are going to sleep. – It’s already 11 o’clock in the evening. Tomorrow we’ll go on spending a holiday. Now – marsch to the bed! – Papi, it can’t be night. 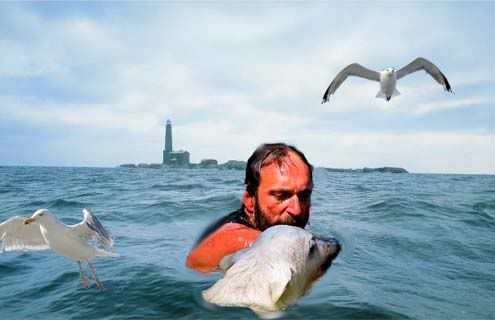 I want to go swimming, fishing, hunting seals…. – KNUTI! Clean your teeth and go to bed. NOW!!! – Why are we pretending it’s night although it’s daytime? – Here in Scandinavia it’s always light in the summer time – even at night. In the Winter it’s always very dark. I’m very tired and want to sleep now. Good night! – Papi, is it morning or is it night? – It is morning now. – But Daddy, how do the people know what time of the day it is? – Yesterday I ate so much my gorgeous belly is still very full…but fishing is such fun. – Miffeeee!!!. Do you want some fish? 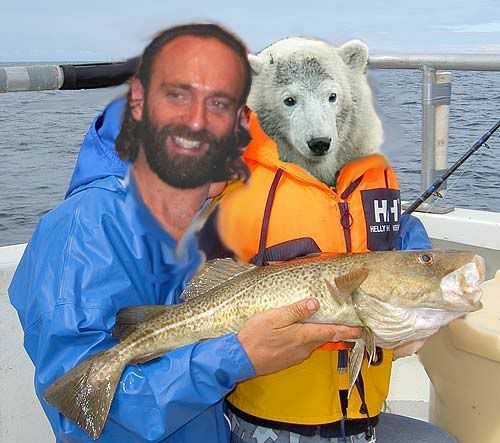 – Who else wants some fresh fish? 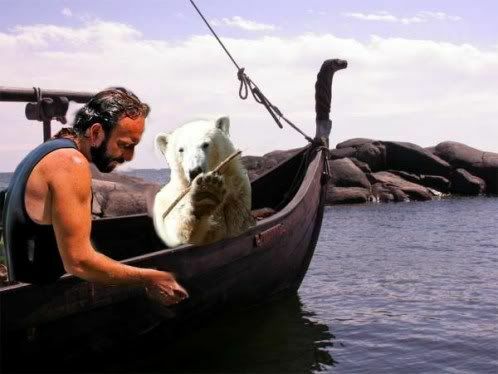 Oh, there’s a boat coming with lots of people…I recognize some of them, oh, they are Knutians, what a surprise. How did they know I’m here on holiday??? – Hallo Dumba! Hallo Annemarie! Hallo Doro! Hallo Sylvia! Hallo Angelika! Hallo Viktor! Hallo Marlene! Hallooooo ALLEN! And Knuseau, of course! – Everybody, please, say KNUUUUT! And SMILE! – Dear Knuti, we must have a serious discussion with you. We understand very well that you and your Daddy need a vacation but there’s a big hullabaloo in Baerlin! The press is screaming loud! You should see the headlines! WHAT’S THE MATTER WITH KNUTI? KNUTI IS SERIOUSLY ILL. HE DOESN’T MOVE! THE ZOO IS TELLING LIES! THE TRAFFIC IS STANDING STILL! THE BÜRGERMEISTER IS HAVING A NERVOUS BREAKDOWN! THE OFFICE OF THE BUNDESKANZLER DOESN’T ANSWER THE PHONE CALLS! KNUTI’S SUFFERING OF A DEEP DEPRESSION! THE MARSIANS HAVE KIDNAPPED TD! – NO, NOOO, NOOOOO! I love it here. I love this holiday thing! 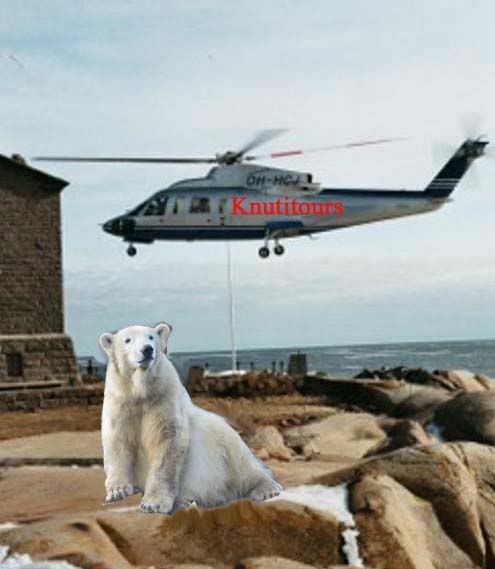 – Aber, Lieber Knut, the whole world is worrying! -Mein, Lieber Söhnlein, Daddy thinks, too, we’d better go back to Baerlin. – Why can’t we have our holiday? – Maybe we’ll have another holiday very soon! – Will you swear, Daddy! – Dear Knuti, even Teddybärenmutti thinks we’d better go back as soon as possible. Maybe you and Daddy can visit me in Bavaria? – Okay, tears, tears….But I want to travel with Auntie Mervi, her knusband and Miffe! – Teddybärenmutti. I’m sure we’ll be having a holiday together very soon! – I’ll be waiting for you. Maybe we can pay a visit to Flocke, too. How about that? – Now everything’s back to normal again. I have a lot of organizing to do. – Depressed? Moi? I’m very ANGRY about the headlines!! – Hmmm, The idea of visiting Flocke is not so bad. Not bad at all! I must make some plans! Danke Liebe Admin! Danke Onkel Marcus! Danke Onkel Ronnie! Mama, Papa, Tanten! Would you like to see some photos and videos? I have taken the pictures myself! I have also a few buckets filled with fish that I caught – I guarantee it’s all very fresh! What a pleasure to get the chance to see/read TEDDYBAREN’s(text)/MERVI’s(collages) former fairy tales in the typical TBM-style! Thanks to TBM and MERVI and wishing everybody fun in celebrating despite of the big loss. diese Urlaubsgeschichte ist so bezaubernd und deshalb besonders passend zum heutigen 11,5 Jahrestag von Knut! Teddybärenmutti, du bist eine phantasievolle und witzige Erzählerin und du Mervi, hast zu dieser reizenden Geschichte die passenden Collagen gestaltet. Dumba, das Algenfoto von Knuts U-Bootfahrten durch den veralgten Wassergraben ist auch wunderbar. I loved the collages, all of them! Thanx to Dumba too. Knut behind the steering wheel of a big car is for sure an unusual sight. I had a good laugh about the fainted police officer. There are so many beautiful and funny memories, so many wonderful stories around this fairy tale. 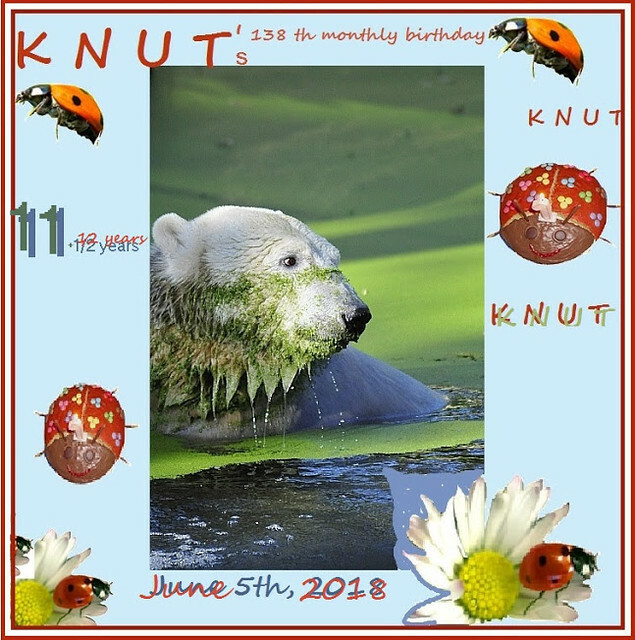 Time flies and the loss of Knut and T.D. still hurts. Thank you for taking us along the memory lane again. ich kannte auch diese Story noch nicht, und habe mich jetzt köstlich amüsiert. Ich wusste gar nicht, dass TDM so tolle und lustige Geschichten schreiben kann, und dann auch noch in deutsch.Chapeau!!! Einfach köstlich. Und dazu die wunderbaren Collagen von Mervi. Das nenne ich richtig gute Teamarbeit. Auch die Collage von “Algen-Knut” hast Du wieder super gemacht, liebe Dumba, Danke. – Nja, hm, ich nur dachte. Herr Doktor Bl…, Blä…, Bla…., Wie kann ein Mann so was eine schwierige Name haben. Einen Tag kam er zu mir und sagte, dass ich darf nie mehr Dich kuscheln. Er sagte. dass ich kann Dich kaputt machen. Papi, ich schwöre. Ich mache Dich nie kaputt. Ich liebe Dich! thanks a lot for another wonderful story and pictures from a time, that passed too fast. Dear Dumba, thanks for your charming Collage. I am so pleased to read this wonderful story again. something which resonated around the world. Diese Geschichte und diese Collagen, einfach herrlich! Ich habe so gelacht und mir gewuenscht, die beiden hätten so einen Urlaub gehabt. thank you so much for these wonderful memories and for the lovely montly birthday card.All the collages are so sweet, in my dreams and my imagination this will never end. Log in | 53 queries. 0.954 seconds.